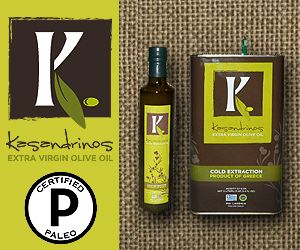 It is my tremendous pleasure to introduce a company to you all….Kasandrinos International. I love to support family owned businesses; what’s better than a brother and sister team?! This twosome Effi and Tony Kasandrinos opened their business to share their passion with us….fantastic imported Greek organic extra virgin olive oil from their father’s village in Greece. That’s not all they offer….they also provide body care products, seasonings, and more! I know I love the “built my business out of my garage” stories, but how about “out of the trunk of my car”??!? Oh yes…that is where it all started! The American dream is in full swing for the active duty U.S. Marine, Tony, who is located in my great state of Texas!! AND his sister Effi who is located in Las Vegas. When you decide to make a purchase, because I know you will! – please use the link below to do so….